If you want to invest in Charleston real estate, one of the best options would be to invest in a single-family home. But how do you know when you have found the right one? We can help you find the right Charleston house using the 10 questions below! People invest in Charleston real estate with very different goals in mind. As such, it is important that you are investing in properties that get you to where you want to be. Do you want to make 40k in the first year? If so, and if you can handle some hard work, flipping might be a better choice than a rental property. However, if you are looking for a long-term, stable source of income, the rental property might be the way to go. Buying a house is more than simply coming up with the down payment and the monthly mortgage payment. There are numerous other costs that come into play when you own a Charleston house. Before making any property investment, make sure you understand what it will entail. Utilities, monthly maintenance costs, property taxes, and insurance costs all might be a bit different than what you are used to. 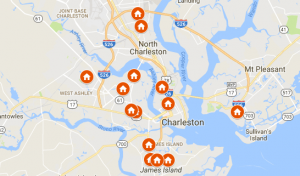 Do you want to purchase a buy to rent property in the Charleston area? This can be an excellent way to create income and build equity. Think about where you are buying and what kind of tenants are actively looking for rentals. Many investors won’t waste their time on a property in a bad neighborhood, even if they are getting a great deal. Always keep in mind who would want to rent your house. Even if you aren’t renting it out right now, you might change your mind down the road. Defining your cap-rate is critical in real estate investment. Determining this number will help you determine if an investment is actually lucrative. To calculate your cap-rate, you simply take the net operating income and divide by the purchase price. The higher your cap rate, the better the profits, however, this often comes with additional risk. There are many other things to consider other than cap-rate, however, using this to compare properties can be tremendously helpful when investing in a single-family home in Charleston.